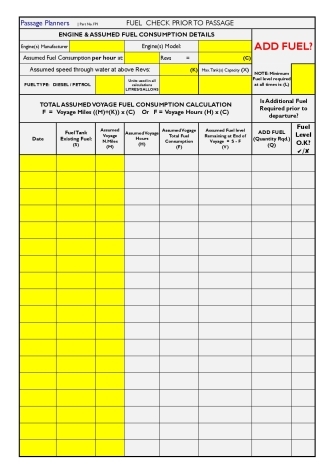 A form to help you assess your fuel requirements for your passage and to assist your passage planning. We also have a software version of our Fuel Planner. Click here for a FREE DOWNLOAD of our beta version. Prior to any passage we need to check our fuel tank level and add fuel if necessary. 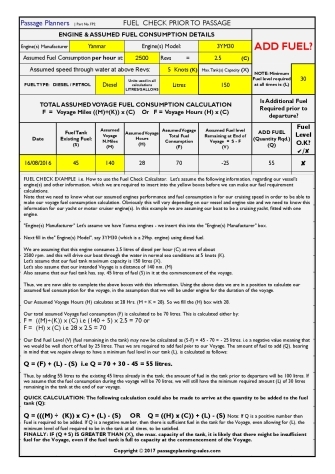 This form helps to assess how much fuel to add to ensure that we have adequate fuel for our Voyage including a minimum spare capacity. On one side of the form we have the full form on which you can enter your vessel's engine(s) details and passage length in order to be able to calculate the fuel consumption for the passage and an assessment that you have adequate fuel in the tank for the Voyage. Full instructions on how to make the calculation, are shown on the other side of the form.